So far this month the river mouth area at the Dog Beach sand bags has been producing Golden Trevally, GT's, decent Flathead and Whiting. Across in the Frying Pan there's quite a few Whiting taking live worms and yabbies and small surface lures such as the Sugapen 58's. The Woods Bays are still producing Goldens, Cale Cale and GT's in the early mornings. Throw prawn plastics such as the Storm GT prawn plastics just in stock. Local angler Matt Major has caught a nice GT and an Estuary Cod on these plastics (see in images). There's been a few Jacks showing up in the river aswell. Local angler Geoff Stirzaker has been getting into a few Jacks in the upper reaches of the river (see in images). As the water temperature continues to rise into summer the Jacks will become a more prevalent catch all throughout the river. The Ski runs, Tewantin Stretch and Doonella Bridge have been producing GT's and decent Flathead. On the offshore scene when the wind permitted, Sunshine Reef has been producing Snapper and Sweetlip. 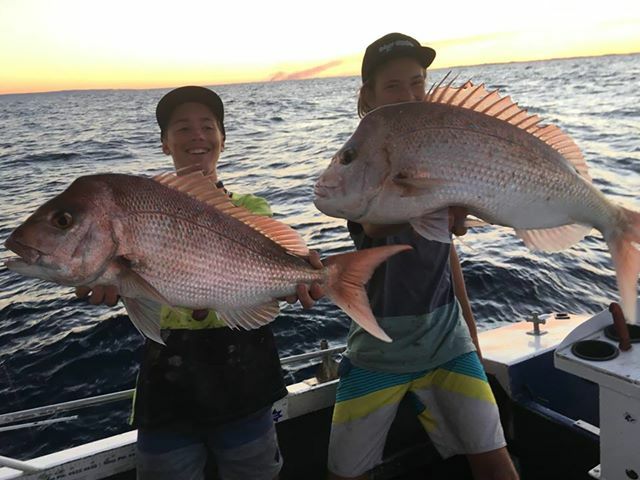 Double Island Point, North and Chardons Reef have produced plenty of quality Snapper, Cobia, Jewfish, Pearl Perch and Maori Cod. Lake MacDonald has had Bass schooling in the Three Ways on blades and off the edges in this area as well. Throw surface poppers and walkers in the early mornings and late afternoons. There's plenty of action out at Borumba! The Hooked On staff have been getting stuck into some great fish on lures such as the Westin 'Ricky the Roach'. The last month of winter produced some good days of fishing in the river. The river mouth area at the Dog Beach and near the sand bags produced Golden Trevally in the mornings, as well as sizeable Bream, Whiting and Flathead. Across in the Frying Pan there's quite a few nice Whiting. Further around into the Woods Bays there have been quite a few Golden, Cale Cale and Giant Trevally caught in the mornings as well. Throw small prawn imitations or small plastics such as the 2.5" Dragon Maggots. 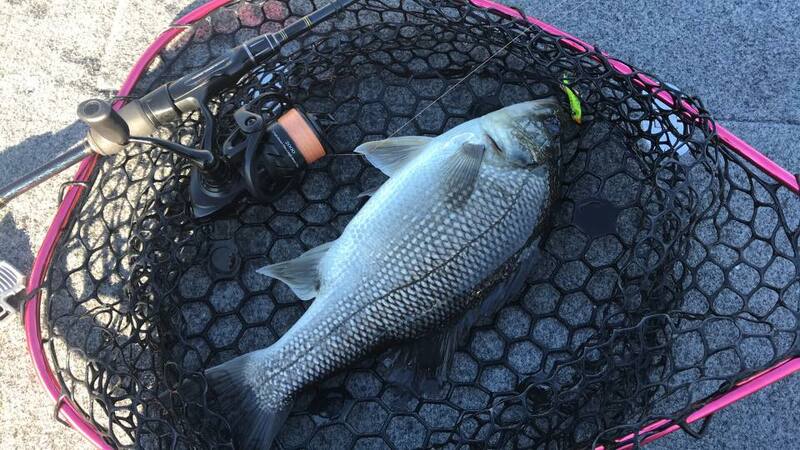 Giant Trevally and Flathead have been showing up around Doonella Bridge, the Tewantin Stretch and the ski run. 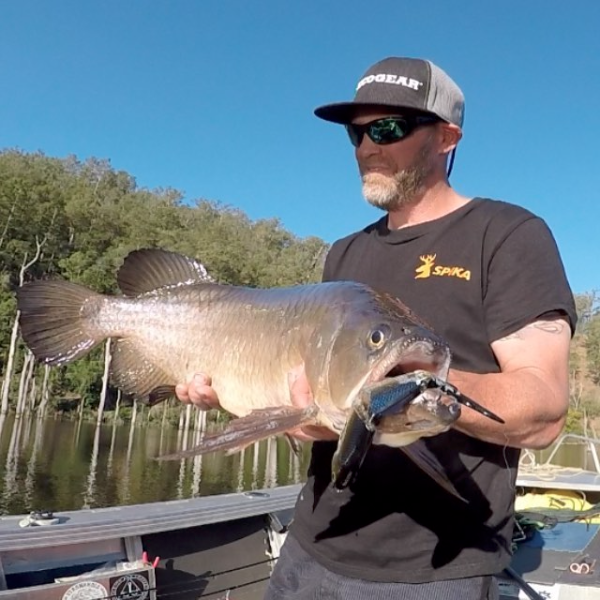 The odd Jewfish are still showing up at the Ski run like staff member Brad's cracker fish in the images, and up between the lakes. On the offshore scene when the wind permitted, Sunshine and Halls Reef have been producing some good Squire, Sweetlip and the odd quality Coral Trout! Out wider, North and Chardons Reef produced plenty of Pearl Perch, Squire, Sweetlip, Tuskfish and Estuary Cod. 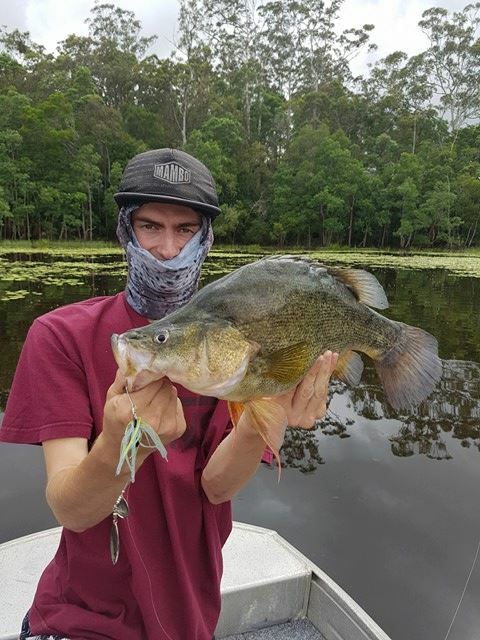 Lake MacDonald has had Bass schooling in the Three Ways on blades and off the edges in this area as well on surface walkers and suspending hardbodies such as Jackall Squirrels and Nories Laydown Minnows. Check out the video below of staff member Brad Maclean having a fun session on Bass and Saratoga using the Jackall 67mm Squirrels. Click on photo’s for full Gallery. So far this month the river has been fishing well despite the heavy boat traffic over the school holidays. Towards the river mouth, there's been some sizeable winter Bream and the odd chopper Tailor, Trevally and Flathead on offer. 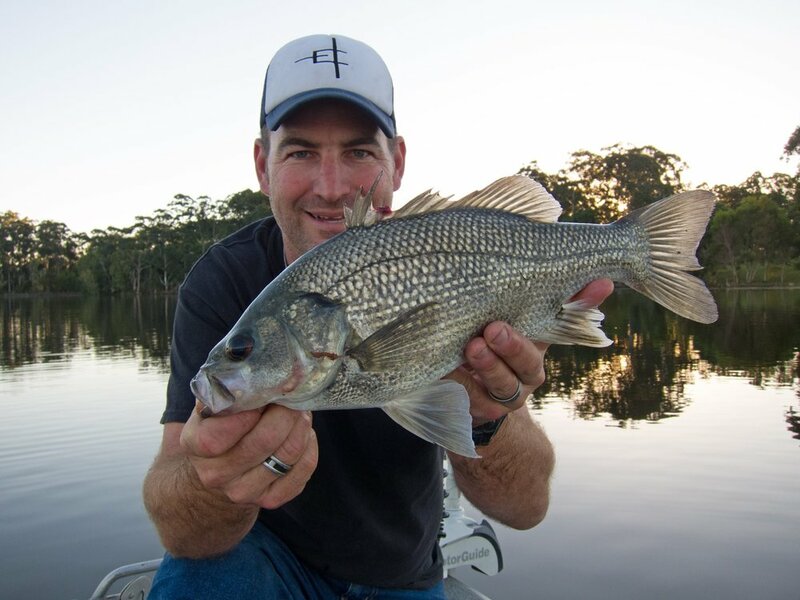 The current line on the outer Woods Bays has been popular amongst the keen lure anglers with Golden and Giant Trevally taking well-presented prawn imitation plastics such as the Atomic Plazo Prongs. At night the back of the Sound has produced a few Jacks aswell. Further upriver, school Jew and Flathead have been caught on soft plastics at the Ski Runs. If intending to take a Jew for a feed, it's important to note that the legal size limit is 75cm minimum. Staff member Brad Maclean having a fun session on the Jew using the new Dragon Lures "Aggressor Pro 4" plastics (video in new Video Gallery on home screen). In close Sunshine Reef has produced some nice pan-sized Snapper aswell as the odd Coral Trout. Fish as light as the conditions allow. Out wide, Double Island Point is producing some nice Snapper and Red Emperor. Staff member Max Maclean and his mates had a fun session on the Snapper at Double Island last week as seen in the image below. As normal for this time of year the Bass are schooling in the lakes. In Lake MacDonald the Three Ways area and around the Bubble Trail has Bass taking Little Max and Ecogear blades, Ice and Nories Jigs as seen in the mouth of Stew's fish below. It's been a pretty good start to February with some nice fish showing up throughout the river. The river mouth area has had plenty of Flathead taking soft plastics such as the Berkley Gulp Nemesis. The dog beach and frying pan have had Whiting taking small translucent surface lures, live worms and yabbies. Golden Trevally and GTs have been caught in the Woods Bays and the coast guard area. For the keen lure anglers throw small prawn imitation plastics, Ecogear Dragon Maggots, Berkley Power bait Minnows and Keitech Easy Shiners. There's also been some pup Jacks caught throughout the river! Staff member Max was fishing the river and landed 8 Jacks in one session on surface. Try behind the back of the sound and up in between the lakes. The weather hasn't been too spectacular for the offshore anglers with persistent winds, however for those getting out have been getting the rewards. 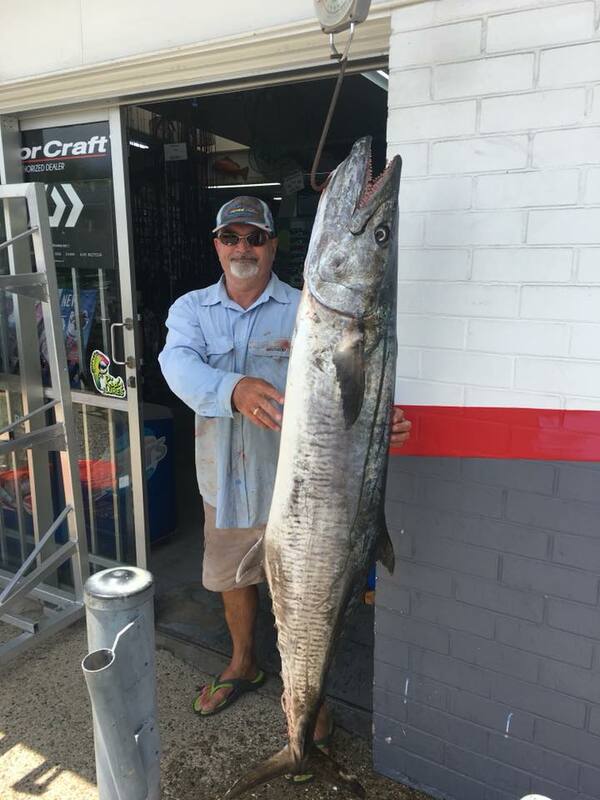 Mark Bisman (image) caught a HUGE 36.4kg Spanish Mack at Sunshine Reef on a pilchard floater! Ed got out the other day and boated a nice spaniard along with Tuskfish and other mixed reefies. Lake Macdonald has been a little quiet for the edge bite however it's still worth throwing surface early mornings and late afternoons for a Bass or Toga. Out at Borumba, the toga have been taking spinnerbaits, surface lures such as the Cultiva Zip N Ziggy's, and suspenders such as the Nories Laydown Minnow. Happy New Year! Despite the busy holiday season, 2018 has started off with some pretty good fishing. Down toward the river mouth area, there's been quality Whiting, Bream and Flathead on offer in the Frying Pan and the Dog Beach. Live worms, yabbies and prawns are the best baits to use in this area. Large flathead will take a well presented soft plastic such as the Berkley 4" Nemesis in the Pink colour. 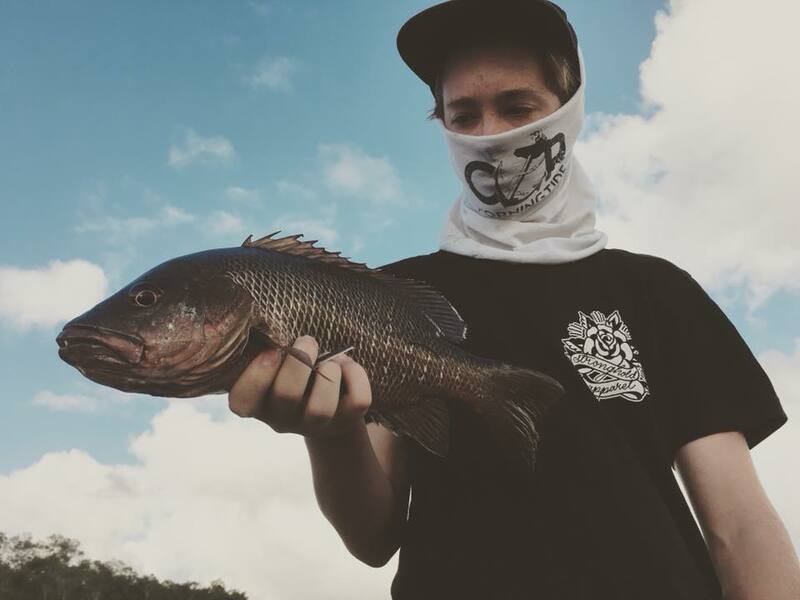 GT's have also been showing up in the Woods Bays and around the Noosa Sound area, responding to surface lures in the mornings and afternoons, and prawn imitation plastics. Along with the warm, humid and stormy weather, Mangrove Jacks have been showing up around the Noosa Sound jetties, and also upriver in the stretch between the lakes. In the early mornings, throw surface for the Jacks in these areas with lures such as the Lucky Craft G Splash or Cultiva Zip n Ziggys. Laguna Bay has been firing with a tonne of Spotted Mackerel busting up on the bait balls, scattered around Halls and Sunshine Reef and Jew Shoal. Throw slugs, such as the Rio's Slugs, at these schools anywhere between 20 to 40 grams. Some nice Spanish Mackerel have been caught at Jew Shoal, Halls, Sunshine and North Reef on the troll, floated pilchards, and have even been taking surface stick baits! Rio's Lethal Action bibless trolling lures have always been a hit on the Spanish. Sunshine Reef has also produced plenty of sizeable Cobia. The next week or so looks great weather wise to get out there. If you're unsure about what gear to use out there, drop into the store and we'll have you covered! Lake MacDonald has been fishing quite well over the past couple of weeks. The Three Ways area has been producing some nice Bass, the odd Yellowbelly and Saratoga off the edges! Throwing spinner baits into the weed pockets has proven to be most effective. The surface bite in the early mornings and late afternoons has also been fishing quite good as well, with the odd Saratoga showing up.